One of the most frustrating experiences you can have as a car owner is having to take in your car to an auto repair shop for repairs. Unfortunately, many people feel intimidated when talking to auto repair mechanics. As a result, their vehicles may not be repaired properly, or the they wind up paying for services that they don't even need. If you feel overwhelmed when dealing with auto mechanics, here are some important tips for dealing with an auto repair shop effectively. Good communication is especially critical when it comes to effectively dealing with auto mechanics. Once a mechanic knows the symptoms of a vehicle and what’s wrong, it’s much easier for the problem to be repaired. Before taking in your car, make a list of abnormalities. For example, does your vehicle smell different or sound strange? Is it leaking, or does it feel different when you drive it? Also, determine the frequency that these conditions occur. Be able to describe how your vehicle was working just before it started having the problem. Be prepared to tell a mechanic when you last brought your vehicle into an auto repair shop, and if the issue could possibly be related to when it was last repaired or serviced. Don’t be afraid to ask questions. If you don’t understand what a mechanic is telling you regarding your vehicle’s problem and how it should be fixed, ask for a simple explanation. Don’t settle for the first estimate, especially if it seems too high. It’s best to get at least four or five written estimates for what the repairs will cost. Then, once you have your estimates, be ready to negotiate. In other words, go to an auto shop that gives you a higher estimate and show the owner a lower estimate for the same repair job from another shop. You have nothing to lose if you’re turned down. If a mechanic is dishonest, he or she probably will probably be hesitate to use simple layman words when asked for an explanation. Recognize when a mechanic is trying to test your knowledge of cars. The best way that a shady mechanic can access how much you know about your car is by asking basic questions, such as the number of cylinders your car’s engine has. Another setup question is quizzing you about the oil weight that your vehicle can take. Study your car owner’s manual. Besides appearing more knowledgeable about your own vehicle, you’ll also may be able to solve simple problems just by knowing more about the basic controls of your car, meaning you may not even have to take it into a shop. Clean your car before dropping it off because a filthy, cluttered car can compromise repair quality. If a mechanic has to first remove heavy items before working on your car, you may not receive the best service. What’s more, the excess weight of too much clutter in a car can cause a car to perform poorly. 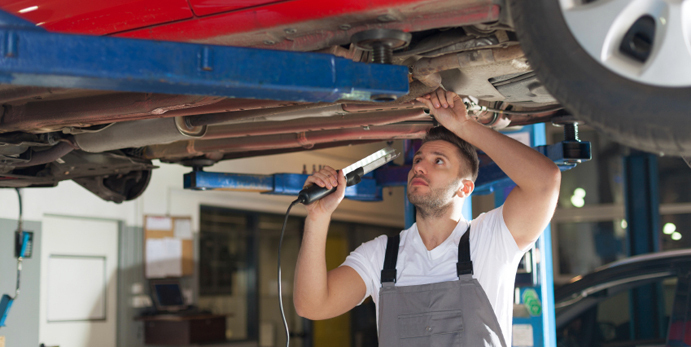 Sometimes, vehicles need to be repaired because they’ve been involved in traffic accidents. Besides having to worry about costly repairs, many drivers also have the problem of increased insurance rates due to additional points on their driving records. In many cases, judges let drivers, who have to make court appearances, attend traffic schools so that their points are reduced. If you’re facing additional points on your auto insurance policy because of a traffic accident and don’t have time to attend a brick-and-mortar traffic school, consider attending trafficschoolonline.com. In addition to providing an online traffic school, we also offer courses in defensive driving for reducing insurance costs and dismissing traffic citations.